Remember that mint condition Gallet Flight Officer that was sold a few months ago? 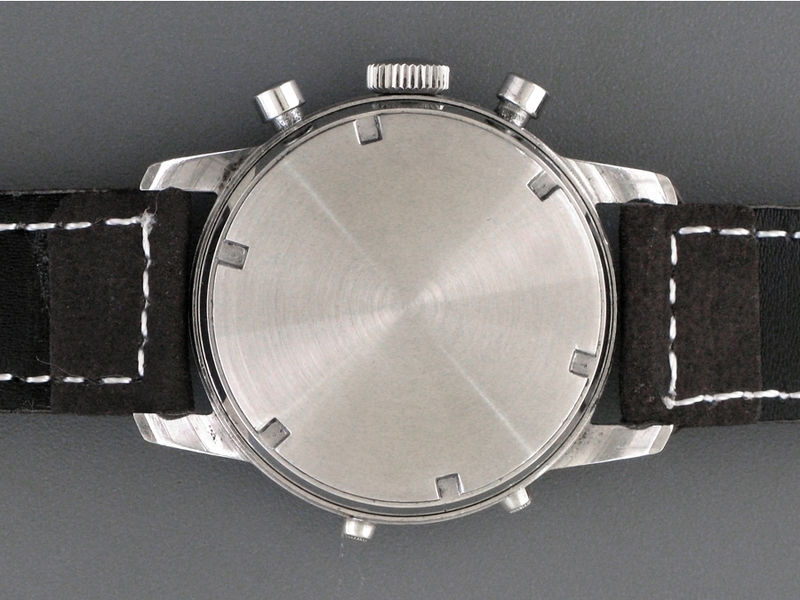 The same seller is back with a rare Gallet Astronomic. Back in June I wrote about a mint condition Flight Officer I saw on Ebay, a true one-of-a-kind piece that was in Museum condition. The seller used to work at Gallet so had unparalleled access to rare and important pieces and she was fortunate enough to obtain several watches during her time there. This time she's selling a stunning Gallet Multichron Astronomic, a triple-calendar moonphase from the 1960's. Long time readers of Timepiece Chronicle will know that I'm a big fan of mid-century triple-calendars so seeing one from Gallet is especially interesting as the brand is known more for their military chronographs than complications. Whilst the Universal Geneve Tri-Compax was produced in large numbers and multiple references over almost forty years, the Gallet Astronomic saw only a handful of models made in stainless steel and 14kt yellow gold between 1955 and 1975. 1940's Multichron case back. Photo credit to theydid. The first Multichron was released in 1914 and Gallet claims it was the first true wrist-worn chronograph ever made. In 1937 Gallet began using their patented Clamshell case on the multichron line which, instead of a screw-back, utilized for deep set screws that mounted the case-back against the main case with a special inner lip of crystal. These cases were phased out during the late 1950's and 1960's in favor of the more common screw-on case back which is what the Astronomic has. Inside the Astronomic is the Valjoux 88, a modified Caliber 72C with the addition of a moonphase module to the lower register. The Valjoux 88 was used across a huge array of brands including Doxa, Heuer, Baume & Mercier and even Patek Philippe and Audemars Piguet. It would take a cold dead heart to look at the 88 inside the Astronomic and not appreciate what drives watch fans to love mechanical movements. Just like the Flight Officer before it, the Gallet Astronomic seems to be in excellent condition and received 'Museum style' service a few years ago, just like the Flight Officer. The case has thankfully stayed clear of a polishers wheel (Not that it needs it judging by the photos) and the dial has also remained in original condition., however there are scratches present on the dial which might dissuade some potential buyers. At the time of writing, the watch sits at $4,150 with the seller giving an estimate of between $15,000 to $20,000. With so few examples made and no previous examples being sold that I can find, perhaps it can get towards those higher estimates but I wonder if the Gallet name has enough cultural cache to secure that high a price. As always, I recommend that anyone looking to buy a watch online do their own due diligence before bidding. Click here to head to see the full listing which ends on Wednesday, 12th October.